Composer Herbert Deutsch (born 1932) was Professor Emeritus of Music at Hofstra University, where he taught for a mere 55 years and inaugurated their electronic music studio, and many other music programs. 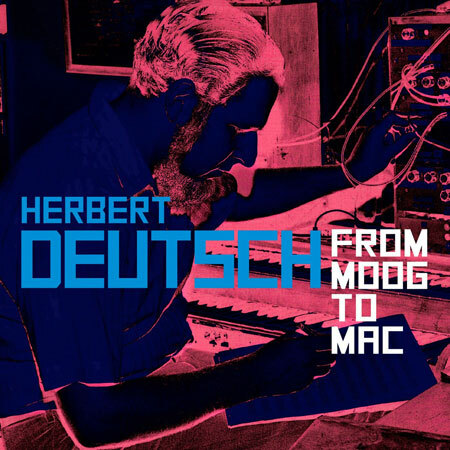 In the early 1960s, he collaborated with Robert Moog on the first Moog synthesizer, providing a musician’s insight to counterbalance and aid the technical breakthroughs of the “mad scientist.” As you may have guessed from its title, the From Moog to Mac CD is a collection of rarely heard yet historic works caught on tape during the early years of the development of the synth, appended with some later pieces on the personal computer. “A Christmas Carol” (1963) presents via tape manipulation an array of cut-up musique concrete sounds—including snippets from a radio play containing news reports of church bombings in Birmingham, Alabama—along with piano, drums, cymbals, ratchet, radio test oscillators, choral singing and scads of low-end synth damage. Some nice drones, echoes and knocks also get thrown into the mix. “The Abominatron” (1964) was the nickname Robert gave the first Moog synth. In this track, he gives a demonstration of the newly emerging instrument, verbally introducing each sound sample. Dissonant and consonant organ-like stabs, and plenty of bleeping sawtooth and squarewave mayhem dot this crude soundscape. You are currently browsing the Arcane Candy weblog archives for May, 2013.